Dayton, Ohio-Dayton Dragons President & General Manager Robert Murphy has been selected as the 2018 Minor League Baseball Executive of the Year by Baseball America, the industry trade publication. The award is presented annually to one individual from among all executives in 16 leagues and 190 teams across Minor League Baseball. Murphy becomes the 17th person to earn the honor since Baseball America began the award in 2002. Previous winners have included five league presidents and 10 team executives. In 2007, the award was presented to Mike Moore, President of Minor League Baseball. 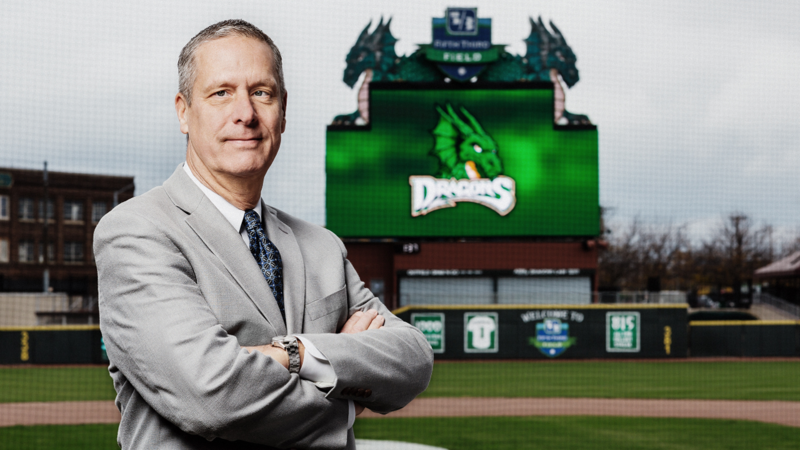 "We have been impressed for years with how well the Dayton Dragons have been run, not just because of their attendance records, but also because of the professionalism and first-class approach that the staff conveys," said J.J. Cooper, Executive Editor at Baseball America. "From promotions to game-day experience to broadcasts, we wanted to honor what Mr. Murphy and his staff have built in Dayton." Murphy has overseen the Dragons day-to-day operation since the organization's inception in 1999. Under his leadership, the Dragons began their still-active streak of consecutive sold-out dates with their first game at Fifth Third Field on April 27, 2000. On July 9, 2011, the Dragons broke the all-time record previously held by the Portland Trail Blazers of the NBA when they completed their 815th straight sell-out. The streak, now at 1,316 straight games, will continue into the 2019 season. The Dragons have become known for providing affordable family entertainment at Fifth Third Field with a commitment to unsurpassed customer service that has become a trademark of the organization. The Dragons have also prioritized strong involvement with three longtime traditions, including the Dragons School MVP program, Anthem Home Run for Life, and the Dragons Hometown Heroes program. Murphy is a native of Buffalo, New York. He joined the Dragons in 1999 after serving in a management position with the Las Vegas Stars of baseball's Pacific Coast League and the Las Vegas Thunder of the International Hockey League. "Thanks to Baseball America for recognizing the Dragons organization with this honor, which is a tribute to our amazing staff," said Murphy. "The Dragons accomplishments are a product of the tremendous support we have received over our history from our fans, season ticket holders, and corporate partners. Our ownership group, Palisades Arcadia Baseball, and our previous owners, Mandalay Baseball Properties, have always given us the resources to do great things in Dayton. Thank you! Thanks also to our Major League partner, the Cincinnati Reds, for their support of Dragons baseball. And many thanks to my family for everything they do and have done to support me and the Dragons." Among the many awards presented to the Dragons over their 19-year history, this is one of the most significant. Previously, Murphy was named Minor League Baseball Executive of the Year by the Sporting News in 2005. He was selected as Midwest League Executive of the Year on two occasions, in 2000 and 2012. Two other major awards have been presented to Dragons executives. In 2016, Dragons Vice President Brandy Guinaugh was named Minor League Baseball's Rawlings Woman Executive of the Year. In 2003, Dragons Vice President Gary Mayse was named Midwest League Executive of the Year. As an organization, the Dragons have received numerous national awards. They were given the Bob Freitas Award by Baseball America in 2004 as the top Single-A franchise in Minor League Baseball. In 2011, the Dragons were selected as Minor League Baseball Organization of the Year by Ballpark Digest. In 2012, the Dragons were selected as the winner of the John H. Johnson President's Award, the highest honor presented annually to one Minor League Baseball team in the nation. That same year, the Dragons were one of five finalists for the SportsBusiness Journal Professional Sports Team of the Year, the first minor league team ever selected as a finalist. The Dragons have received recognition for their support of the military by earning the Midwest League's nomination for the Minor League Baseball Charles Murphy Patriot Award for three straight seasons from 2016-18, the first three years of the award's existence. The Dragons have won many other local and regional awards related to operations, marketing, community involvement, and family entertainment over their history. Most recently, the Dragons were named by Dayton Business Journal as the Miami Valley's 2018 Customer Service Business of the Year.